This past week, our class went on a field trip to USD’s Creative Collaborations, their annual undergraduate research conference. 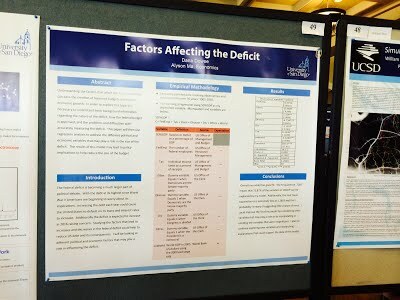 In this event, students from USD conducted research on something that they were or are studying, prepared a poster board showing their results, and then presented them to the guests that attended the event. When we arrived, we essentially got the freedom to approach any poster that we wanted, as long as we visited a minimum of four, and one of those was from the chemistry/biochemistry department. There were at least 150 posters in the room, and they ranged from issues such as World War I to why there is not enough black coaches in the NFL, and many, many more topics. 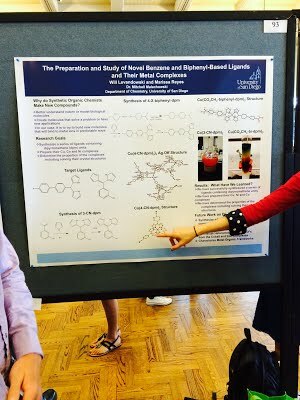 The seven poster boards that I visited were Factors Affecting Deficit by Dana Dowse, The Preparation and Study of Novel Benzene and Biphenyl-Based Ligands and Their Metal Complexes by Will Levandowski and Marissa Reyes, React or Evaporate? 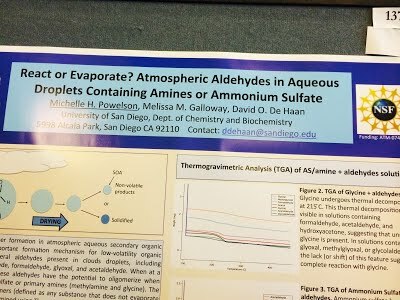 Atmospheric Aldehydes in Aqueous Droplets Containing Amines or Ammonium Sulfate by Michelle H. Powelson, Melissa M. Galloway, and David O. De Haan, The Polyhedral Atlas by Paul Short, Ryan Barney, and Jacob Bruce, Reimagining Public Sonic Space: Building Soundmarks by Ryan Barney, Effects of Crowding on DNA Self-Diffusion Using Single Molecule Methods by Stephanie Gorczyca, and Are Wide Receivers in the NFl Financially Rewarded for Traditional Statistics or the Value they Bring to their Team? by Ronald Pratte. Factors Affecting Deficit was a study of the evolution of the deficit from 1960-2010, and what factors influenced the change. Ms. Dowse hypothesised that if the causes could be specifically targeted, then it would be easier to construct legislation aimed at reducing the deficit. The most interesting trend to me that she found was that the deficit rises at a faster rate when there is a Democratic president in office when compared to the deficit rising rate of their Republican presidential counterparts. The Preparation and Study of Novel Benzene and Biphenyl-Based Ligands and Their Metal Complexes was about producing an entirely new chemical compound that could be used to filter water, power hydrogen cars, conduct electricity. The most interesting thing that I learned from this project was that a filtering device that has electricity running through it is more efficient at detecting maladies in the water such as lead. React or Evaporate? Atmospheric Aldehydes in Aqueous Droplets Containing Amines or Ammonium Sulfate was about student’s research into brown carbon. From this presentation I learned that scientists are not sure of what exactly brown carbon is, and do not have an official name for it besides brown carbon. In addition, when a substance containing brown carbon is heated, large amounts of brown carbon remain; thus, it does not evaporate or dissipate in the air, which explains why it lingers and causes more pollution. It can also cause serious health problems, such as cancer and birth defects. The Polyhedral Atlas was one of my favorites because of it’s elegant simplicity. From this project I learned that there is 5 different polyhedrons that were just used over and over again in the design of some of the most iconic human creations over the past two centuries. Reimagining Public Sonic Space: Building Soundmarks connected the idea of soundscape with architecture. 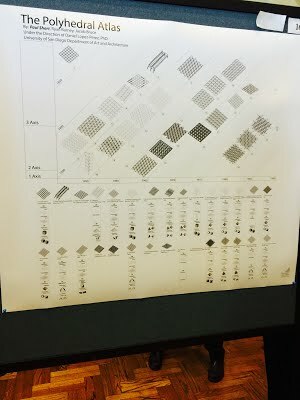 From this project I learned about how sounds in an area affect the way people experience that area, and how sound can be efficiently re-created to enhance the experience. Effects of Crowding on DNA Self-Diffusion Using Single Molecule Methods was mainly about how crowding in cells affects diffusion. The most interesting thing that I learned from this presentation is that by studying how DNA reacts, we can better understand our cells, greatly helping the the successful creation of artificial cells. Are Wide Receivers in the NFl Financially Rewarded for Traditional Statistics or the Value they Bring to their Team? took a closer look at what influences general managers in the NFL when paying the people that play an offense’s most strategic skill position; wide receiver. From this poster I learned that math can really be applied to almost any situation to obtain results. Overall, I think this experience was incredible. We go the opportunity to, not just learn about what modern-day college students are working on, but also ask questions directly to the students themselves. I can honestly say that every panel that I was fortunate to look at left me impressed in one form or another. I believe this project also had a sense of uniqueness because I, as a sophomore student in high school, could empathize with what the university students were going through. What they were doing for their undergraduate conference, we had essentially done for our We Can Change the World Festival Del Sol Exhibition. That is also why I believe many of the presenters confused us for college students; from the questions we asked it was evident that we recognized the process they had to go through. That being said, I do not know that the conference met all of my expectations. In professionalism and presentation of information, I believe that students from High Tech High easily beat out those from USD. Of course, there were a few presenters here and there that made their level of higher education evident through their speech and professionalism, but for the most part that was not the case. Do not get me wrong, the information on every panel was incredibly thoughtful, fascinating and inspiring to whatever it applied to, it was merely the presentation of that information that was extremely below my expectations. If I was forced to attend either an Exhibition at HTHCV or Creative Collaborations only for the presentation of the information, rather than for the information itself, I would easily, and unbiasedly, choose to attend an Exhibition at HTH. 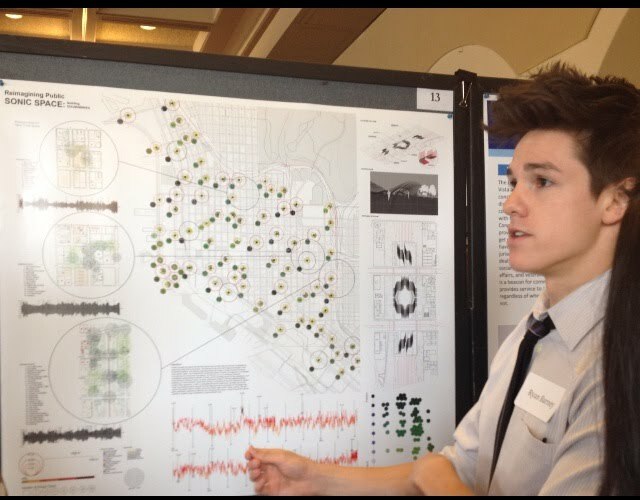 If I had to choose the things that interested me most during this experience, I would have to say that they would have to be Ryan Barney’s presentation on soundscape and architecture, and Stephanie Gorczyca’s presentation on the different reactions of DNA in different environments. Mr. Barney’s presentation was specifically interesting because he literally wanted to alter the sound of an area to make that area more enjoyable. In his research, he looked at three specific areas in San Diego County where the city was looking into building parks. The only problem was that all three of those areas were extremely close to a highway, and as everyone in the US knows, highways are loud. What he proposed as a solution was to build specifically designed large, metal, tube-like structures that would distribute and recreate the sounds that they collected into musical notes. Thus, the entire park would ring with a quiet, easy melody produced solely by the sounds that the metal pipes collected. Ms. Gorczyca’s research was enthralling because of what she envisioned. She specifically wanted to study how strands of DNA reacted in Dextran, a substance similar to protein. Her experiments found incredible results; instead of the DNA lengths curling the way they usually do, they were actually expanding and untangling themselves, to the point where the DNA almost looked like a ladder. Her research and results were extremely interesting, but they paled in comparison to why she was gathering that information. Her long term goal is to better understand our cells and their properties, which could eventually lead to the production of artificial, fully productive, cells. I believe that this expo really did help my understanding of chemistry in the real world evolve. Before this event, I thought that chemistry lived in the past, with the periodic table already complete, the structure of an atom already known, and the composition of molecules and compounds already recorded. I did not think that chemistry was one of those things that evolved with time, and could be tailored to help solve modern day issues. It showed me that chemistry is still extremely relevant in the real world, and I now understand 100% why those infatuated with chemistry are so passionate about it. On a more personal level, I had no idea how directly related physics and chemistry could be in the real world, and this is super exciting to me personally because, as of right now, I one day hope to be a nuclear and quantum physicists. This year I began to recognize huge similarities between physics and chemistry and what they encompass in education, but I had no idea whatsoever that the work being done in the real world (specifically the work of physicists) was so directly related to chemistry. This event also forced me to restructure my definition of the word “research.” Before this, I always thought research was the study of that which others had already accomplished. In other words, I did not categorize a work as “research” if the question being asked had not previously been answered. Now, I know that there can be an enormous difference in the definition of research in your science and in your humanities class; a fact I had previously been oblivious to. If you would have asked me last week what my thoughts of research in college were, I would have rolled my eyes, made an annoyed face, and said I was not looking forward to it. Now, the words research in college represent one aspect of my future education that seems extremely exciting.